Barry Greenstein stopped by the stud hi-lo event to see how Eli Elezra was doing. Barry bet 10-1 against him winning a bracelet and was curious about his progress. Eli is currently leading the tournament with 350,000 in chips. "If I win this, I won't owe any more money to Barry!" Eli quipped. Barry is perhaps the most successful cash game player on the planet. He has literally won a fortune in the biggest side games in the world and decided he wanted to donate millions to worthwhile charities. So far he has donated over $3 million to charity, most of it to his passion project "Children, Inc."
Barry is incredibly modest about all of his accomplishments. Just this past Wednesday, he and his son Joe Sebok were featured in a special World Poker Tour episode called "Fathers and Sons" which ended with Barry and Joe taking down Doyle and Todd Brunson in a very entertaining match. 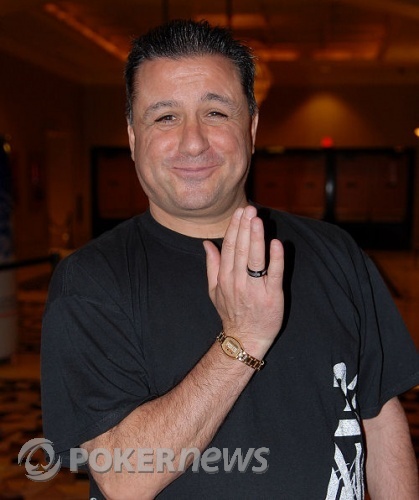 A recipient of the Brian Saltus Award, Barry is the essence of class and integrity in the poker world. The bar he sets for all of us is amazing.